Like any family member, our furry friends can get sick. While our human loved ones can usually tell us when something doesn't feel right, pets aren't always able to communicate when they are in pain or not feeling well. Some ailments are easy to spot while others can be hidden by that special optimism our pets have for life. It takes a lot to deter a dog's freedom but, extreme weight loss, lethargy, lack of appetite, consistently loose stools are some signs of potentially bad news: possibly Exocrine Pancreatic Insufficiency (EPI) (EPI). The more noticeable symptoms of EPI are weight loss and the inability to regain that weight. EPI occurs when the pancreas is unable to create the enzymes needed to digest food. 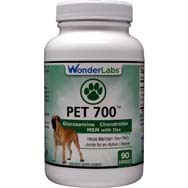 This prevents your pet's body from absorbing all the nutrients in their bowl at dinnertime. About 82% of dogs with EPI don't get enough B12 and this could be slowing down their recovery and affecting their freedom. Veterinarians usually treat EPI pets with Pancreatic Enzymes and Vitamin B12 shots which are extremely expensive. For both man/woman and his/her best friend, B12 plays a key role in the creation of personal DNA and in cellular health. It assists us as we heal and recover. For our furry friends, it can also aid EPI pets with weight gain. This is an important benefit for dogs suffering with this terrible disease. Wonder Labs knows every moment with your pet is precious so we've developed Pet Factor B12 to assist in your dog's recovery. 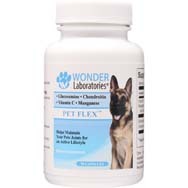 Wonder Labs' Pet Factor B12 is just as effective and, in some cases, more effective than the B12 shot per www.EPI4Dogs.com, and a lot less expensive. 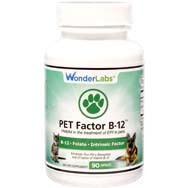 Pet Factor contains the intrinsic factor that is crucial to the absorption of vitamin B12. Without intrinsic factor, vitamin b12 cannot be absorbed through the stomach. It also contains FolicAcid that prepares the B12 for absorption. These ingredients set Pet Factor apart from other B12 supplements because they increase the chances of the vitamin being able to aid your pet. Your dog does not have to be sick with EPI or any other disease to benefit from Pet Factor. Just like their human counterparts, supplements can help our pets stay healthy, happy and energetic. 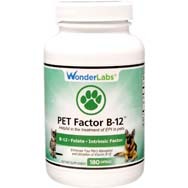 Order your Pet Factor B12 today and watch them grow healthier tomorrow.